The competition for the most depraved example of the pred- atory state capitalism of the Reagan-Thatcher neoliberal era is fierce. In this chilling study, based on careful and courageous reporting, and illuminated with perceptive analysis, Antony Loewenstein presents many competitors for the prize, while also helping us understand all too well the saying that man is a wolf to man. 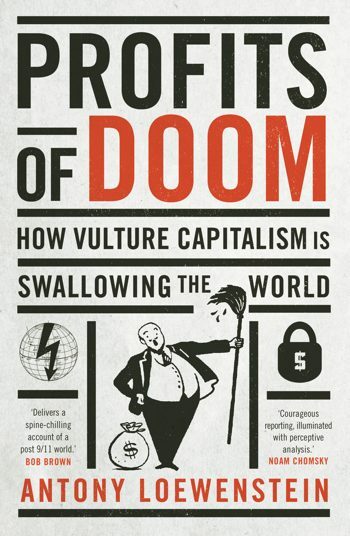 Profits of Doom nails the mad idea that the drive for profits will create global wellbeing.Antony Loewenstein delivers a spine- chilling account of the post 9/11 world taken over by vulture capitalism and its political cronies. And this is what we are voting for. Antony Loewenstein’s Profits of Doom is a powerful indict- ment of the corporations and governments across the globe whose unquenchable thirst for resources and power threaten the stability—perhaps even the very existence—of the planet. Loewenstein is no armchair academic or cubicle journalist. The stories in this book are the product of years embedded, in military and economic warzones, with the disempowered of the world, the people from Pakistan to Papua New Guinea and beyond who have the audacity and bravery to fight back against all odds. Loewenstein’s keen sense of justice is evident on every page of this book as he gives voice to the voiceless and confronts the powerful. Profits of Doom is a devastat- ing, incisive follow-up to Naomi Klein’s The Shock Doctrine. A great exercise in joining the dots, on essential terrain that too often is ignored.At a time when rapacious private interests campaign to destroy government— so they can cash in on its absence—Loewenstein reports from the frontline in an insidious war. In Australia, so often bereft of voices of dissent and courage, Antony Loewenstein’s tenacious work stands out. Profits of Doom is a journey into a world of mutated economics and corrupt politics that we ignore at our peril.